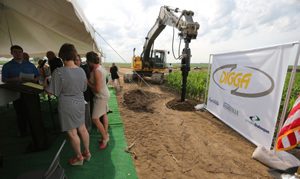 DYERSVILLE, Iowa -- Dignitaries and economic development officials from across Dubuque and Delaware counties gathered at the 20 West Industrial Center in Dyersville Tuesday morning, gold shovels in hand, to welcome Digga to eastern Iowa. The new Dyersville location of the Australia-based manufacturing company will produce gearboxes and augers for earth-moving equipment to be distributed nationwide. Construction has begun on a 35,000-square-foot facility, that, when complete, will bring around 30 jobs to the area. 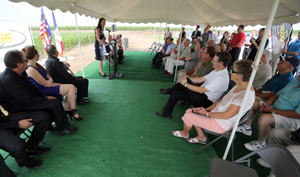 Before dirt could be ceremonially shoveled, several speakers welcomed Digga CEO Suzie Wright and her advance team to Dyersville. 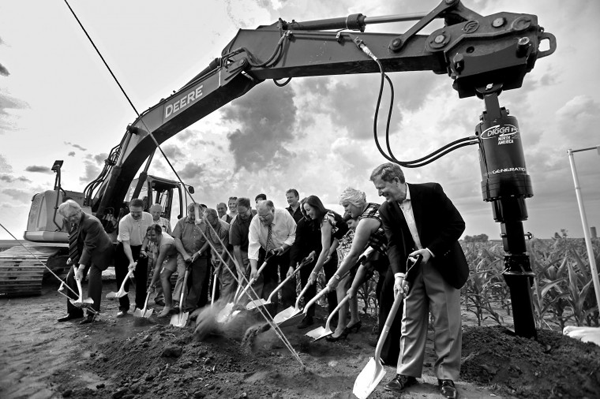 Rick Dickinson, executive director and chief operating officer of the Greater Dubuque Development Corporation, said that he anticipates Digga to be a contributing factor to continued economic growth in the area. "Economic development is a team sport," Dickinson said. "So Suzie, welcome to the team. We're proud to have Digga as part of the corporate family in the greater Dubuque area." Dyersville Mayor Jim Heavens joined Dickinson in praising Digga. He compared the relationship between a city and a commercial development to a marriage that, with the right amount of work, can be successful. "From our side, I think we married well," Heavens said. Wright praised Dickinson and Jacque Rahe, executive director of the Dyersville Economic Development Corporation, for their efforts to lure Digga to Dyersville. Area officials were able to offer a number of incentives, including a potential $1 million tax break over the duration of a development agreement with the city. Other factors worked in Dyersville's favor as well, Wright said. Jobs-training benefits are available from Northeast Iowa Community College, and the workforce is already suited to the industry. Wright said she expects construction to take around 14 weeks, but temporary work areas could be set up in as little as two weeks. An initial hiring period will follow, but the full 30-person staff will not be filled until late this year or early next year.